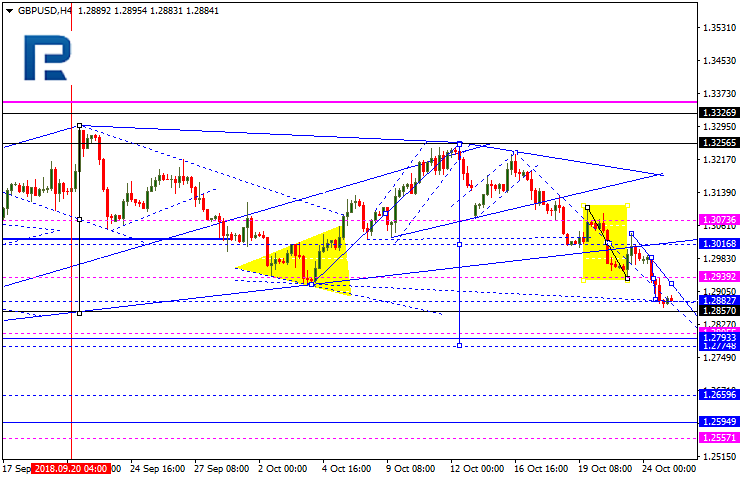 EURUSD has reached 1.1400, but may yet continue moving downwards. 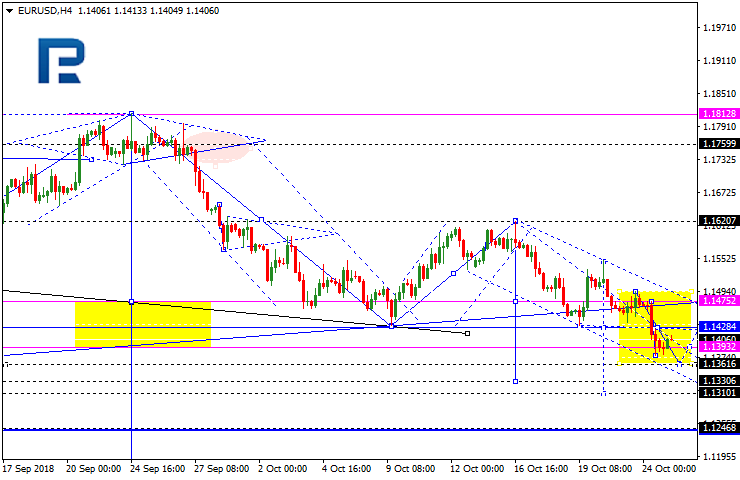 Possibly, today the price may test 1.1428 from below and then start another decline towards 1.1365. After that, the instrument may form a new ascending structure to test 1.1425, thus forming a continuation pattern close to this level. The target of the third wave at 1.1247. GBPUSD is still forming the third descending wave; it has rebounded from 1.2939 and right now is still trading downwards. Possibly, the pair may fall with the short-term target at 1.2800. 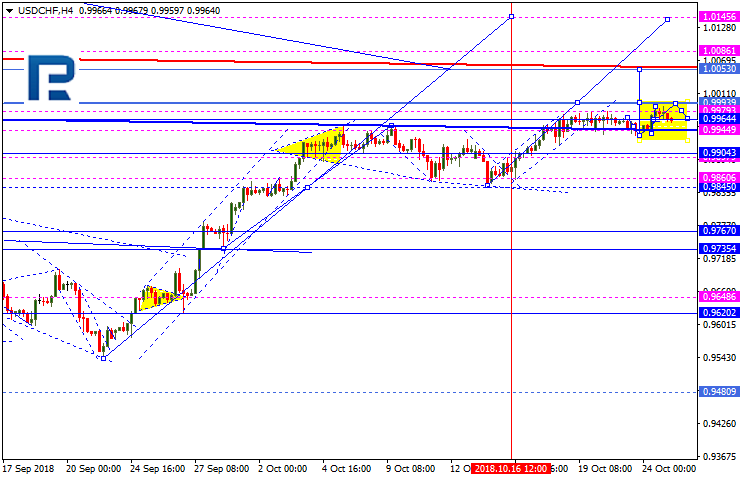 USDCHF is still consolidating around 0.9955. Today, the pair may grow to break the upside border at 0.9994 and then continue trading inside the uptrend towards the target at 1.0055. However, if the range is broken to the downside, the instrument may choose and alternative scenario and start a new correction to reach 0.9915 and then resume trading inside upwards to reach the above-mentioned target. USDJPY has completed the descending wave at 111.82 and may form a new consolidation range in the form of the Triangle pattern. 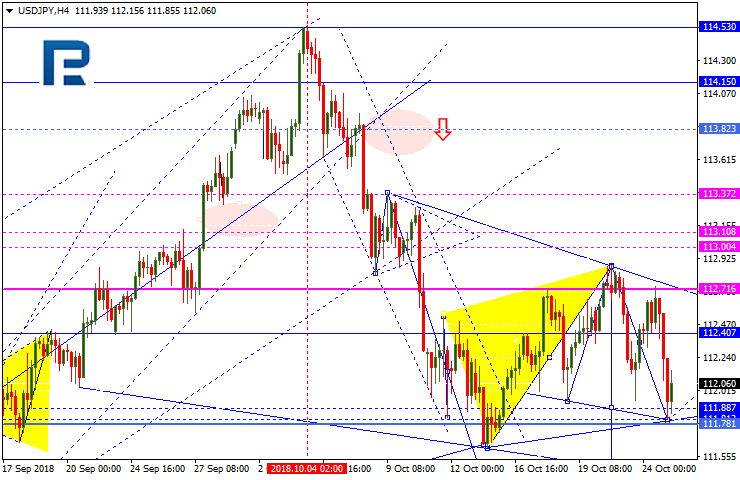 Possibly, today the price may grow to reach the upside border at 112.40. If the instrument breaks this pattern to the downside, the price may continue falling towards 110.93; if to the upside – continue the correction with the target at 113.10. 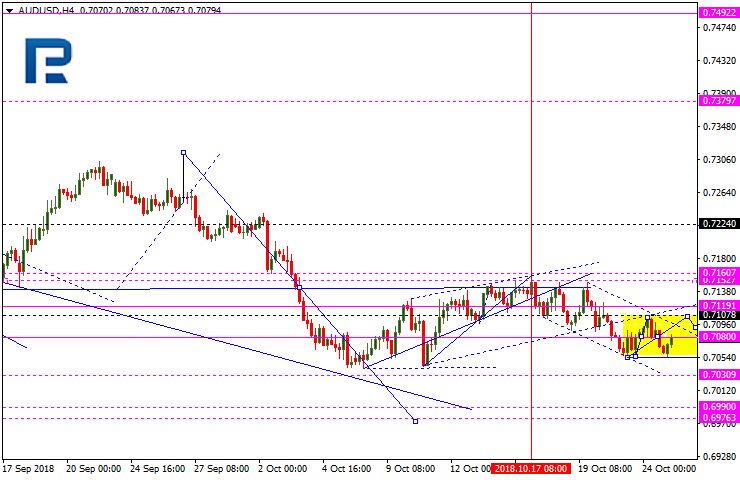 AUDUSD is still consolidating close to the lows. Today, the pair may grow towards 0.7108 and then fall to reach 0.7080. If the instrument breaks this range to the upside, the price may continue growing towards 0.7116; if to the downside – resume trading inside the downtrend with the target at 0.7000. 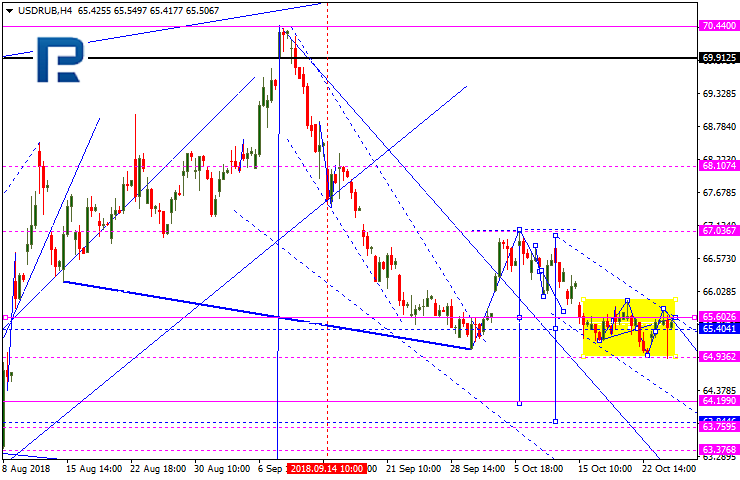 USDRUB is still consolidating around 65.55. If the instrument breaks this range to the downside, the price may continue the third wave towards 64.20; if to the upside – start a new correction with the target at 66.50. 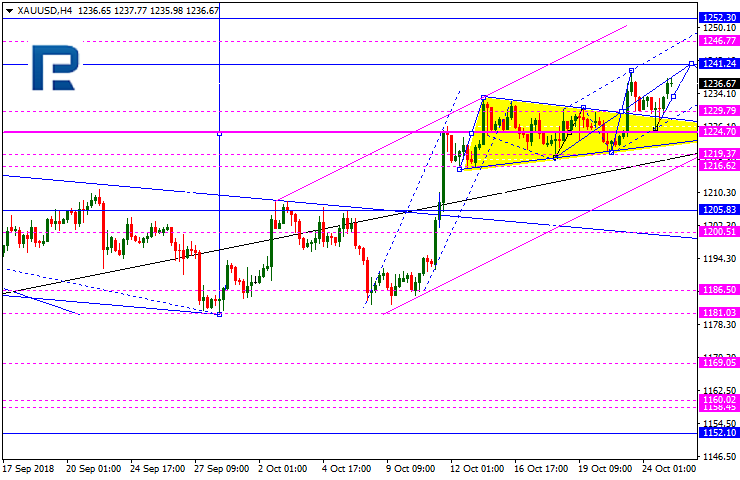 Gold is forming another ascending structure towards 1241.24. Later, the market may fall to reach 1229.75 and then start a new growth with the target at 1252.30. The instrument is expected to extend the third wave towards the short-term target at 1266.90. Brent is forming another consolidation range near the lows. 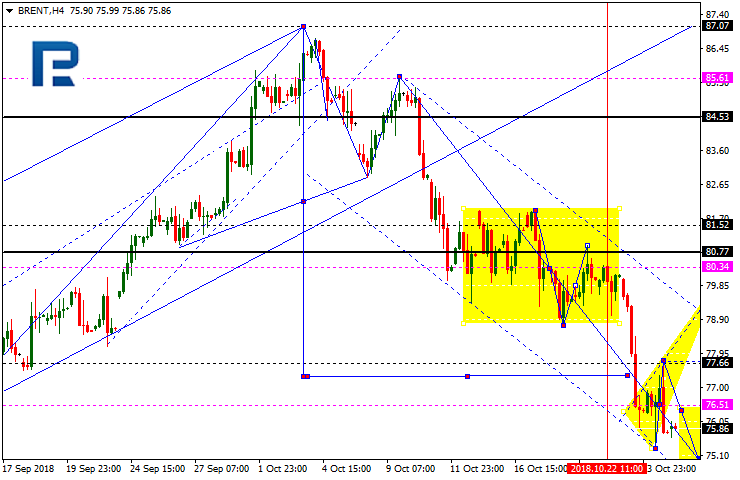 Possibly, today the price may expand the range towards 75.00. Later, the market may grow to reach 77.66 and then fall towards 76.50. If the instrument breaks this range to the downside, the price may extend this structure to reach 73.60; if to the upside – start a new correction with the target at 80.35.